An Automatic Variants Port. The author of the textures is LatterOfTheThree. 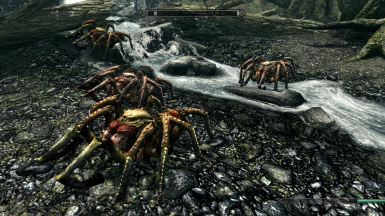 Contents: 5 new textures: : Frostbitespider(2), Hagraven(1), Mudcrab(2). AV by Leviathan1753 makes it possible that when 6 Hagraven are shown there is a change (depends on how the dices roll) that all six use a different texture. Monday 2012-08-06: Version 1.0 has been released. Major improvement is that it can now be installed with Nexus Mod Manager, Mod Organizer and Wrye Bash 299. MO support has been untested by me but a user has reported that AV 1.5.1.1 with MO 0.11.4 works. want to thank Arkangel for his help to get WB 299 support working. This mod page contains a so called Automatic Variants Package (AVP) which is ONLY usable in combination with Automatic Variants by Leviathan1753. A better description would be Automatic Variants Port because I did not create the textures myself but I'm using textures created by real texture artists. 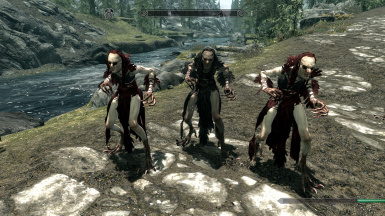 Also this slideshow of pictures of AV-tized NPC's created by Leviathan1753 might give you a good impression. More information about Automatic Variants and what it is can be found on my on my Nexus page called "Wolverines collection of Automatic Variants Ports tools and resources" . I have contacted LatterOfTheThree and asked him if I could use his great textures for an AV Port and he gave me permission, for which I'm grateful. This resulted in the creation of the AV Port shown below. The way I see it, its not up to me to decide what textures users should use or like. This is also the opinion of the auhor of Automatic Variants. AV has a GUI which enables users to enable/disable specific textures for a NPC. It also has a .dds file viewer builtin which shows a flattened skin of a NPC. 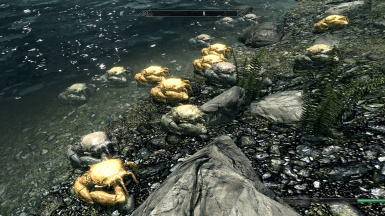 Hence users can create the Skyrim experience they prefer. 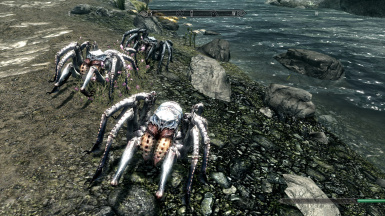 Contents: Variants for Frostbitespider(2), Hagraven(1), Mudcrab(2). Updates: Support for the Nexus Mod Manager, Mod Organizer and Wrye Bash 299 installers. MO support has been untested by me but a user has reported that AV 1.5.1.1 with MO 0.11.4 works. Note: The author also has 8 spriggan textures. Sprggans are female and AV has no NPC female support atm. Start the AV GUI, enable the "Wolverines AV Ports -- Author is LatterOfThThree" AVP and do a 'Gather&Exit'. Goto the "SkyProc Patchers\Automatic Variants\AV Packages" directory and remove directory Wolverines AV Ports -- Author is LatterOfTheThree. Goto the /data/docs/wolverine2710 directory and delete directory AV Port Author is LatterOfTheThree. If there are no other directories in this wolverine2710 directory you can remove it.